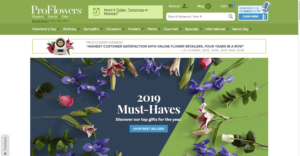 Here’s our list of top 10 flower delivery websites – perfect for every occasion from Mother’s Day to sending Thanksgiving centerpieces or Christmas bouquets. 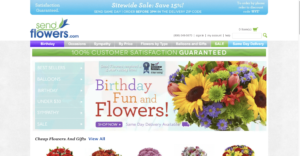 If you’re ready to order, you may want to check out these Flower Delivery coupons. The Bouqs Co. is a sustainable, eco-friendly farming, flower company that only cuts what they sell. Once you place an order the flowers are cut, arranged, and shipped. Hand Crafted Bouqs are designed by local Artisan Florists and can be delivered the same day. To make ordering easier and cheaper they offer subscriptions so you can send the gift of flowers regularly to someone. 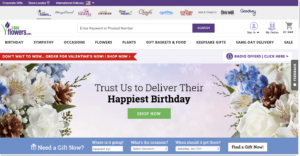 You can shop by Delivery Time, Origin, Flower Type, and Occasion. Each arrangement has a description, origin of flowers, size options, and vase option. Some of their arrangements also offer free delivery to make it more affordable. You can find Bouqs coupons on our site to save even more on their flower bouquets. ProFlowers offers beautiful flower arrangements for every occasion. Their site is easy to navigate and ensures that the shopping experience is easy, effortless, and enjoyable. The recipient will love the floral arrangement because ProFlowers guarantees ready to bloom flowers with a seven day freshness. Their categories range from occasion, flower type, plant type, and specials. Choose between standard, deluxe, premium, and ultimate when deciding how big of a gift you wish to send. They also offer same day delivery if you order by 2pm Monday through Friday and by 1pm Saturday and Sunday. Want to score a deal on Proflowers? Find daily deals and discounts for Proflowers on our site. 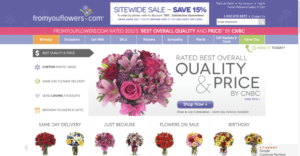 1-800-FLOWERS offers floral arrangements and gift pairings to customers internationally. The website is easy to navigate in order to provide customers with sending the perfect gift. You can search through categories based on occasion, season, or flower type. The floral arrangement is designed with a vase to match, ranging from colorful glass vases to tins, boxes, and ceramics. You can customize you gift by selecting different vases or adding a gift. They offer sale items and frequent promotions to make sending a gift affordable. FTD provides floral products and services primarily within the United States and United Kingdom. They offer a seven day flower freshness guarantee. FTD is a safe choice because they guarantee customer satisfaction. If you aren’t happy, you can get a full refund or a new bouquet. Flower arrangements are easy to shop for, with menus set up by occasion, season, flower type, plant type, and same day. You can also find flowers and bouquets that are on sale (or use an FTD promo code!) to make gift giving more affordable. Local FTD florists arrange every order to ensure freshness and quality. Each product is attractively designed, described, and photographed to help the customer find the perfect floral arrangement. CNN recently awarded From You Flowers with the Best Overall Quality and Price. You will find everything here from cheap flower bouquets to luxurious rose arrangements. All their products are thoughtfully organized into categories like occasions and flower type for the shopper’s convenience. The sender can adjust the size of the arrangement to fit the occasion. The vases also vary in choices, such as no vase, clear, colored, or even a custom photo. There is also an option to add a special note or gift to personalize the order. They offer a selection of arrangements for same day and even 4 hour delivery. Want to save even more? Check out our coupons for FromYouFlowers. Teleflora is a flower arrangement distributor that provides floral arrangements and gifts for every occasion. They offer their services across the U.S. and Canada. Every Teleflora order is sent to the recipient’s local florist to be freshly arranged and hand delivered. You are able to shop by flower type, occasion, best seller, or the recipient guide. Their vases range from simplistic glass vases to ceramic mugs, pitchers, mercury glass, and other unique containers. If you place your order before 3pm Monday through Friday or by 12pm Saturday or Sunday, then you can have the arrangement delivered the very same day. You can score a teleflora coupon or take advantage of one of their deals daily to make purchasing affordable. 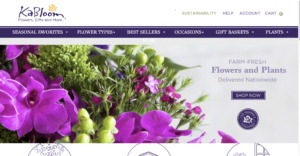 Calyx Flowers is a company that sources flowers from all over the world to provide customers with the best product. From the farm each flower is carefully packaged according to flower type and sent to a flower shop for arrangement. 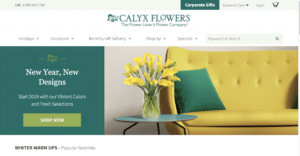 Calyx Flowers offers beautiful blooms year round and sources globally. The flowers are sent as buds to ensure fresh blooms that will last longer. They offer a wide collection of vases, cachepots and baskets to pair with each arrangement. The categories are just as expansive from bouquet and flower type to farmers market and flowers in a hat box. Select a flower arrangement to read a description of where the flowers are sourced. You’ll also get to see everything included in the order so that there aren’t any surprises (other than the flowers, of course!). The recipient will also receive care instruction with their gift to keep their flowers beautiful long. Kabloom is a flower arrangement company designed to bring farmers and customers together to make sustainability more affordable. They focus on helping medium and small farmers become sustainably certified. The flowers arrive as buds so the recipient can watch the flowers bloom to maturity and have fresh flowers longer. You can shop for flowers based on seasonal favorites, best seller, flower types, occasions, and plants. Besides flowers, Kabloom also offers different plants like succulents and herbs. Each arrangement is eloquently photographed and simplistically described. You can decide whether you want a vase and the precise date to send the gift. When you sign up for their newsletter you will receive a 10% off coupon. 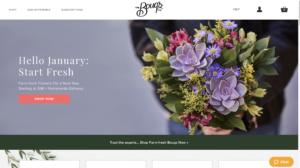 Send Flowers is an online flower delivery service that provides the customer with a one stop shop for all their flower needs no matter the occasion. The promise a 100% customer satisfaction guarantee or they will provide a resend of the arrangement or a full refund. For spontaneous or last minute gift ideas they offer same day delivery options. The gift of flowers does not have to be expensive when using their under $30 category. Browse through their selection with ease by choosing a category that best describes your flower needs. When placing your order you can change the size of the arrangement from regular, deluxe, to premium as well as add a gift of balloons, sweets or a bear. You can personalize the gift by adding a sentimental note. The site is also offering $5 off all products for same day delivery. 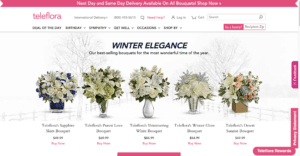 BloomThat offers intentionally designed modern floral arrangements nationwide but has just been acquired by FTD. PopSugar, Today, and InStyle have been raving about their beautiful arrangements and speedy delivery. If you live in the Bay Area, LA or NYC, you can order and send your gift in the same day. However, overnight delivery is available for other cities in the USA. Categories range from Top Picks and Signature Blooms to Bunches and Plants. You also have the option of adding a little gift with your floral arrangement such as sweets or a candle with certain arrangements. There is also a do-it-yourself floral gift that provides the recipient with the joy of planting and designing their own succulent. BloomThat makes it easy to order on the go by downloading and using their IOS app. Want to read some other reviews? Check out Good Housekeeping’s review of the top flower delivery sites.